Elbroc have developed the RB Prop system for use as stope and long wall gold mine support to improve safety and reduce production costs. 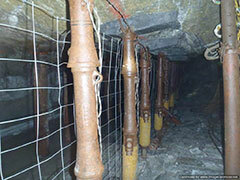 This re-usable hydraulic prop system promotes the prevention of rock falls and controls rock bursts in the stope whilst providing blast on support. Elbroc is leading the industry with its RB Prop System, and innovation that offers safety at a reduced cost. This is a revolutionary new ergonomically designed prop system. 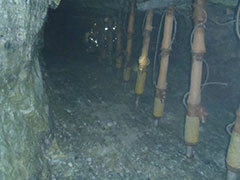 The conical extension system provides solutions to mining vastly differing stoping widths, and ultimately controlling them. The Elbroc Omni-valve satisfies all the industry's requirements in rockfall and rockburst valving. This compact, interchangeable valve is externally accessible and exceeds the industry's yield benchmark of 3 metres per second. Elbroc RB80 RYHP's is a sophisticated but robust piece of equipment with extremely reliable performance in a seismic active environment.